Atari 2600 (Atari VCS 1982 წლამდე) — მეორე თაობის სახლის ვიდეო თამაშების კონსოლი შემუშავებული Atari, Inc-ის მიერ. გამოვიდა 1977 წლის 11 სექტემბერს. იგი იქცა პირველ წარმატებულ კონსოლად სათამაშო კარტრიჯზე და მიაწერენ მიკროპროცესორზე დაფუძნებული კონსოლების პოპულარიზაციას (პირველი კონსოლი მიკროპროცესორით იყო Fairchild Channel F.
Atari 2600-ის მეორე მოდელი „Light Sixer“. Perry, Tekla; Wallich, Paul (მარტი, 1983). "Design case history: the Atari Video Computer System". IEEE Spectrum. 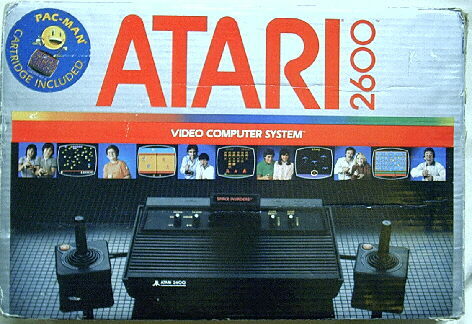 ↑ “Atari VCS (Atari 2600)“, A Brief History of Game Console Warfare, BusinessWeek. წაკითხვის თარიღი: 31 იანვარი, 2008. ↑ Jeremy Reimer. (1 სექტემბერი, 2006) EA's Madden 2007 sells briskly, but are games gaining on movies?. Ars Technica. დაარქივებულია ორიგინალიდან - 23 თებერვალი, 2008. წაკითხვის თარიღი: 31 იანვარი, 2008. ↑ Kent, Steven (2001). The Ultimate History of Video Games. Three Rivers Press. ISBN 0-7615-3643-4. ↑ Weesner, Jason. (11 იანვარი, 2007) On Game Design: A History of Video Games. წაკითხვის თარიღი: 13 ნოემბერი, 2007.
ეს გვერდი ბოლოს დარედაქტირდა: 23:45, 10 აგვისტო 2017.